Café d’Epoca recently launched its website that revolves around personalization and coffee discovery. You take a simple 6 question profile assessment quiz and it designates your flavor profile type. It then recommends which Profile Coffee type you should drink and associated origin coffees that match your flavor type. Throw it in your compost: Coffee grounds are 1.45% nitrogen and contain calcium and magnesium to add some trace minerals you may not get from your other organic material. Coffee grounds are a green material (I know coffee is brown, but same idea as grass clippings) so you should add with at least equal amounts of brown material (leaves) but if you are like me my browns are way to high already. Add it directly to your garden: I have seen some arguments that coffee grounds are acidic, but others claim it loses most (or all) of its acidity during the brewing process. Due to my natural curiosity I need to know the answer. So the answer is, it has an average pH of 6.9 so for all intents and purposes, it is neutral. Though if you are really tired and forget to brew it, it will be somewhat acidic. Fertilizer: Sometimes your plants need a little boost in the morning as well. 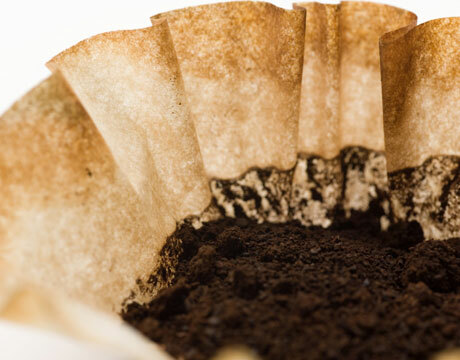 Simply add a couple cups of coffee grounds to a bucket of water and let it seep for 24 hours and apply to plant in the same way you would compost tea. Using gardener terms I can’t think of any better name for this as “coffee tea” If you are busy/lazy you also can use it as a side dressing on top of your soil and let the rain seep it for you. Annoy your pests to stay out of your garden: It has been said that coffee grounds can deter cats from using your garden as their own personal commode. There are also reports that it can deter slugs as well. I am not sure if it is the abrasive soil effect on their sensitive underside or just the cruel reality that with their slow pace they can’t do anything with the caffeine rush they get. Coffee grounds may annoy ants to convince them to move their home elsewhere. Feed your worms: To worms this stuff is like ice cream, if you listen carefully you may hear them cheer your name when you add a handful to your worm bin when your greens from the kitchen may be a little lacking. According to Starbucks brochure, you should use the coffee grounds within 3 weeks to get the most nutrient value, though if you are composting I am sure you can start out the process in the bag if you really want to. Given that 16.34 billion pounds of coffee is produced each year there is plenty for you to save from ending up in a landfill. This is a great way to help the environment while also adding value to your garden without affecting your pocketbook.